#278. 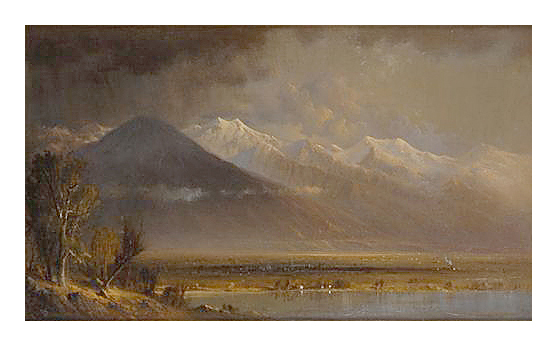 Lake Utah -- Okrah Mountains (sic). 13.5 x 23, oil on canvas. "Gilbert Munger 1873" lower right. A label shows: "Trinity College, Hartford, Connecticut / Gilbert Munger / Lake Utah - Okrah Mts. Cattle / Camp (Storms in Distance) / #M-106 1873" The title is misleading. Perhaps better would be Mount Olympus, Wasatch Range, Utah. 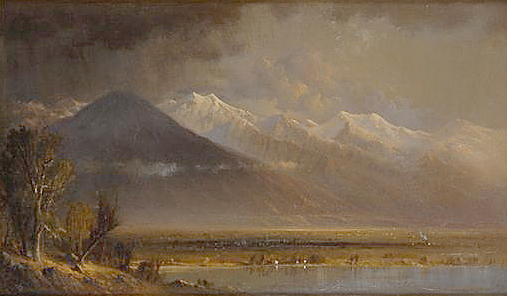 The painting depicts a view similar to that of painting #218 and shows the Wasatch Mountains viewed to the southeast from the vicinity of Salt Lake City. Munger returned east from San Francisco in 1873 and would have traveled through Salt Lake City. Whether this is a plien air painting made on that occasion, or a studio product from a sketch is not apparent, but in either case it is a close rendering of the actual scene. Sold for $14,000 + 15% as lot 430 at the Stair Galleries of Hudson NY sale on 8/9 May 2010 to Thomas Colville Fine Arts of Guilford, CT (Munger's birthplace).